Houdini 12.1’s new integrated ‘smart asset’ store. The price of Houdini Master has been cut to $4,495 and the software renamed ‘Houdini FX’. Houdini Escape becomes plain ‘Houdini’. Side Effects Software has cut the price of Houdini Master by over $2,000, renamed it ‘Houdini FX’ and released version 12.1 of the software. Its sister edition, Houdini Escape, which lacks Houdini FX’s particles and dynamics tools, has now been renamed plain ‘Houdini’. The news is part of a series of Side Effects announcements from Siggraph 2012, including the launch of a new online store for stock assets, created in partnership with spin-off firm Orbolt. The price of Houdini Ma… Houdini FX falls from $6,695 to $4,495. Houdini Escape… sorry, Houdini, remains priced at $1,995. Studios signing up to Side Effects’ Annual Upgrade Plan will now receive the first year for free. Houdini 12.1, released at Siggraph, also includes the new integrated Orbolt Smart Asset Store, enabling users to share customisable 3D assets from within Houdini. Rather than being confined to models and textures, the assets in question range from “fully rigged props to render-ready visual effects, animatable characters to game assets”. Assets may be authored using either a commercial licence of Houdini or the the free Houdini Apprentice edition. Houdini’s new Digital Asset technology packages up each asset into “a single node with an artist-friendly interface” prior to release. Like conventional digital marketplaces, the price of an asset is determined by its author; unlike most marketplaces, each one will be “tested and verified” by the Orbolt team before being allowed to go live. 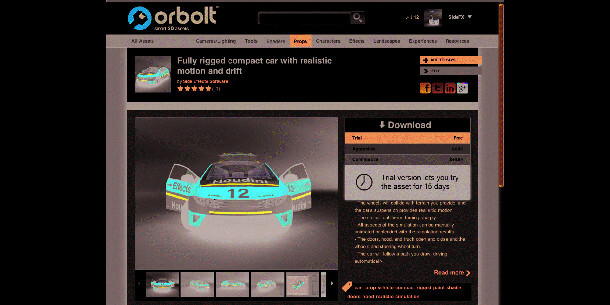 To sell assets, users will have to apply for membership of the beta program via the Orbolt website. The site isn’t publicly assessible at time of writing, but should be by the time you read this story. Other features in Houdini 12.1 include the ability to create edge groups, optimisations to FLIP fluids, Mantra rendering and Pyro FX. Houdini 12.1 is available for download now, for Windows, Mac OS X and Linux.